Piku is a good film. No this is not me trying to damn with faint praise. Piku *is* good. Even more than good, I would say it is courageous. In a world of cookie-cutter behemoths , to invest in a film that is paced slow, driven by characters, and set in a non-Oye-Oye-Shava-Shava socio-cultural milieu, requires commercial cojones, and props to everyone associated with Piku, from the big B and the Choice P to the director to the guys who actually put money behind it, for providing us with something that I would not hesitate to use the term ‘risky” to characterize. However it is not great. But it could so very well have been. It comes very close, several times as a matter of fact, to touching something that is deeper and darker and universal, but almost, whether intentionally or not I cannot say for sure, it draws back into a comforting, crowd-pleasing but ultimately unsatisfying green zone. But before I explain this rather strange criticism, of evaluating something on the basis of “could have been” than “what is”, a word or more than a few about potty humor. Scatological humor, when played for shock value, is something I find most trite and tiresome, especially since I am not ten years old any more. However here, it seems to serve a purpose, that of establishing something defining about the psychology of Bhaskar Banerjee. It is quite common, at least for people his age, to be obsessed with their own excretions and their body in general, and not because they find it funny in the way a pre-teen would, but because their bodies react to unpassed stool in a way very different from how they would have at the age of twenty, leaving them, to use the perfect English word in this context, “bilious”. 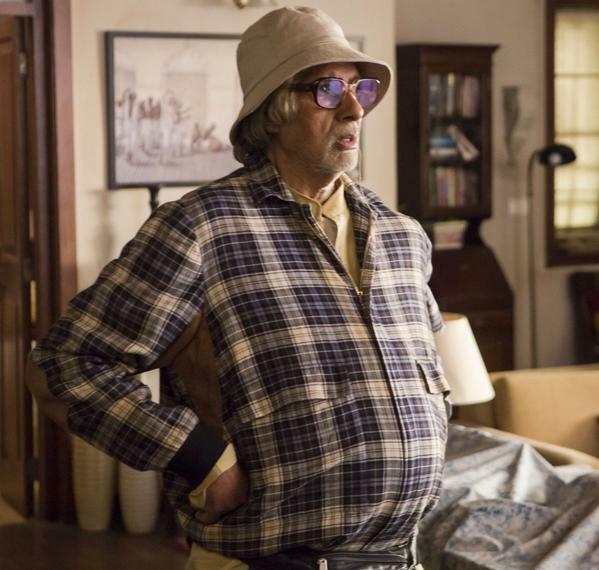 And it’s not just , and here Piku gets it pitch perfect, a mere physical malaise. With very little to otherwise occupy their minds and with nothing left to achieve, no office to go to, no children to get ready for school, old people turns inwards, obsessing about motions and the changing color and consistency of their stool in a way that becomes almost a psychological affliction in itself. Now I do not have exact data for this, but it could be that this is particularly acute for Bengalis, obsessed as we are about catching cold and stomach bugs from youth itself, which explains the ubiquitous presence of the monkey cap, the strips of Gelusil and the Mahendra Lal Dutt umbrella in the Bengali life kit, and this fact in itself makes Bhaskar Banerjee an entirely believable creature. His potty-fascination then becomes a metaphor for his self-obsession, rather than an egregiously offensive plot-device played to get titters from an audience, forming a starting point for his character arc. It’s this arc where Piku works spectacularly, ending as it does with Bhaskar Banerjee finally liberating himself from the bounds of his own device, by cycling about in his old city and partaking the oily snacks that every Bengali in his heart craves and it is precisely because the climax has no drama, no impassioned tear-jerking, no sweeping background score, that it brings a lump to the throat, in the way only something this real can. Which brings me to the daughter, Piku, played with great understatement by Deepika who is surprisingly becoming the best actress of her generation (who would have thought after “Om Shanti Om” that this would happen? ), and her relationship with her father, and here is where my problems with the film start. To put it simply, it is way too sunny. The conflict between the father and the daughter is too polite, too low intensity, too gentle to be even mildly realistic. Or rather mildly interesting. So you have the father telling prospective suitors that his daughter is not a virgin, and the daughter is only slightly irritated by her father’s eccentric honesty. The father’s fastidiousness leads to the hired help quitting and once again, the daughter is mildly miffed. There is never a confrontation between the two, never anything resembling real tension. Not once does she explicitly, and with great passion, raise the very real possibility that her father is sabotaging her relationships intentionally, so that she stays and cares for him, he being someone who does not trust professional caregivers. Because this happens. All the time. Parents strangle the lives out of their grown children, because they expect to be looked after, and children soldier on, often reluctantly and at great cost to their own future happiness. There is tension here, there is emotional violence and blackmail, and yet bizarrely there is also sometimes love, sacrifice, and genuine tenderness. But yet we never see this kind of conflict in the movies. In the black and world of popular Hindi cinema, the parent-child relationship has been fetishized to an extent that the only characters that may be shown are cardboard, either Alok Nath’s half-crying smile and Nirupa Roy’s desperate eye-fluttering or the evil smirk of the son that abandons his parents, usually under the influence of the modern “bahu” (Rajesh Khanna’s Avtar). And that’s where I felt Piku would bring some welcome nuance, a touch of darkness in the light of comedy. Not that one doesn’t understand why a director would pull punches. Satyajt Ray’s “Aparajito”, far superior cinematically to “Pather Panchali” (my personal opinion) was commercially less successful than its crowd-pleasing predecessor, partly because audiences were freaked out by the aloofness of Apu towards his ailing mother, tempered though that coldness was by moments of genuine warmth”. Even Ray, brave as he was, diluted the original narrative of Bhibutibhushan where the tension between mother and son was even more pronounced. While in the movie “Aparajito”, Apu when he hears of his mother’s death starts crying in the way a good son should, in the book he actually feels good, a fact that he recognizes with only a smidgen of guilt, liberated from that which tethered him to the rustic life he was so eager to abandon, till he sees the jars of achaar and realizes that there is no one to stop him from opening one, which is when he breaks down and starts bawling. Even as a very immature teenager which is when I read Aparajito, with little knowledge of emotional nuance and the grey tones of life, I was moved intensely by the scene, and I suppose I was expecting something similar from the cerebral entertainment that Piku seemed to promise. There was nothing like it. Nothing even remotely close. Like going to take a dump with the expectation of something toilet-shattering and then coming out gently shaking your head. Not that it wasn’t good, just that it wasn’t liberating. You know what I mean right? Agree with you. I personally know 6 females whose parents not only didn’t want that their daughters marry, but actively scuttled the attempts of their daughters to marry. in one instance, one couple had 5 daughters till they finally had a son. by the time the son grew up, he realized he a lot on his plate already, so began distancing himself. So, the third daughter, who was my friend, decided to remain unmarried to take care of her parents. the coveted son is relieved, and enjoys his life while his sister slogs at home and at work. There are so many films lecturing children, especially the “modern bahus” on how one should take care of one’s parents/in-laws, but none on the selfish parents (“Mein Zinda Hoon is a case in point, but it was about parent-in-laws, not parents). This one came close too, but just about. I dont agree. You forget that there was also a subtle romantic track running in the movie where Irfan Khan was the irreverent non-Bengali character who alone voices the fact that the father was sabotaging his daughter’s relationships. If Deepika had done that herself, Irfan’s character wouldnt have had any real purpose. Also, I think the director wanted Deepika to be the silent suffering type who expresses mild irritation at her father but vents her domestic frustration out on unsuspecting strangers (like the drivers or her colleagues). Being a Bengali daughter myself, this is a film I deeply connected with and a more apparent display of tension between father and daughter would have, for me, defeated the purpose entirely. And to add to the above, the idea was not to demonize the father; it was to highlight an idiosyncracy which caused a lot of irritation but which would, in retrospect, evoke humour and fondness. The film did try to bring in out on more than one occasion how the father, once reminded of his childlike selfish behaviour (mostly by Irfan Khan), felt guilty and tried to make amends. The dark tension you wanted to see in the film would have entirely changed the light-hearted tenor of the film which may not have been intended at all. Bongbabe got it right. Neither was the father seriously trying to scuttle daughter’s marriage prospects, nor was the daughter so desperate to get married that she would be mad at the father for doing what he was doing. Sure, she would have preferred if her father didn’t bring up the topic of her hymen status first thing with potential suitors, but given her strong independent character , I don’t think she believed that that action of her father alone could wreck her marriage prospects. So mild irritation was indeed the right response. Bhasker Bannerjee wasn’t selfish in a scheming, evil way. Not by a mile. He was just self obsessed as in he cared very little for anyone else. Not because he hated them, just that others weren’t worth caring about as himself. And this in a very endearing way. I know, having lived with a very similar character all my life. As soon as we came out of the hall, first thing my daughter said was, “wasn’t amitabh character so much like grandpa (my dad)?” And that’s exactly what I was thinking too. I failed to see anything endearing in Bhaskor Banerjee. He seemed quite evil to me and was quiet relieved for Piku when the buddha died. I believe the director got scared of a ‘parampara’ backlash from our great Indian hypocritical ‘baRo-ka-samman-karne-waala’ society. I mentally bowed to you as I read this. I cannot change my life anymore but that you raised and articulated this issue is some kind of a reassurance. A solace. Must say one of your best movie reviews I have read. Strangely it had passed my mind too. Perhaps because of somewhat similar life experiences. Piku is a good movie – and while GB can do all the nit-picking he wants, I am just so grateful that Hindi movies have moved away from the formulaic. I would be scared to be too critical of movies like Piku – in case those who finance such movies get cold feet!! The great thing is that it has found a mass appreciation as well – which is after all the final approval – i.e. the bottomline!! Kudos to Shoojit Sircar for not diluting the story and keeping it pretty much tight! great performances as well! Haven’t seen the movie yet but opining anyway (like a bong). You could have penned something about the director Soorjit Sircar. I just watched his movie that inspired me on Masand and the two movies you listed are the movies that inspired Soorjitda too!!! Ray. And that explains why this movie is hit. Ghosh of kahaani fame also had a hit on his hands when he followed in his master’s footsteps. So bottomline is, if your references are the great masters, then your ‘crappy’ product will still be better smelling than the rest. P.S. planning on see it later this wkend. Entire movie hall was filled with bengali women’s laughter. Bhaskar banerjee is influenced by western ideas. He is a learner and interested in new ideas. I feel there are mixed results with women liberation & homeopathy/allopathy. Shoojit Sarkar has made a move that walks the thin line between art cinema and commercial cinema. While I agree with Great Bong’s review of the movie, doing the movie the way he suggested would have pushed it well into the art cinema category. I had not read any reviews or heard from friends about the movie, so I did not have any expectations before I watched it. Almost every other dialogue in the movie made me chuckle. I found the characters in the movie wonderfully quirky and eccentric, something which is rare in hindi movies. Overall I thoroughly enjoyed the movie. Would like to add that it was like watching a Wes Anderson movie in look and feel. The characters were far less pretentious. One thing that struck me was that the lives of Piku, her father and that of the character played by Irrfan Khan appear to be singularly boring to the point of depressing. Piku / Irrfan’s work lives don’t seem to excite them, at least work, dreams related to work etc. are not discussed at any time, which I found strange, especially when both are small business owners. There is no discernible social life of either Piku (except for that rather tasteless & tactless date) or Bhaskar. I understand Bhaskar is an old man, but he doesn’t seem to have any adda circuit, morning / evening walk circuit etc., just nothing. Also Piku / Bhaskar don’t even seem to go for weekend nature retreats / picnics etc., anything to break the monotony of being cooped up in a small 2 BHK. Which also brings me to Piku / Bhaskar’s Delhi digs being quite a boring place, considering he’s a retired ITC (should be an executive from his pontification) hand and she’s an architect and partner in an architecture firm, not a low paying profession, that. Overall, very conducive to a constipated view on life. The portrayal is most likely realistic, but the lives are not happy. Irrfan’s character’s life also appears pretty depressing. Sure his sister’s divorced, but that’s not really the end of the world, they’re a middle class family, not starving, life goes on. Mother’s loud and irritating, but he himself sort of fuels her negative fire with acidic comments and confrontational and unsocial behavior like leaving for Kolkata without even informing, not purchasing anything, not even rosogollas for either mother or sister from Kolkata etc. The only good thing was Irrfan’s character plays tennis, which is a change from the monotony, but I would have thought he’d have a girlfriend or lady friends, or at least have a circuit of friends, interests outside work etc. The environment at both houses appeared pretty stressed out. Ideal is a fiction. Comparisons do not make sense every time. What the reviewer has written are his thoughts based on his previous experiences. Avocado and apple taste different but one cannot compare with both of them because both are different and serve different purpose. This movie is made in India and has found place in every newspaper of the world because it has made an impact from India. Deficiencies are always there as no one is perfect in this world. But comparing is mindless. I would bet with the same budget, no Hollywood director would make even will be able to complete half the movie. With the limited resources at his disposal, the director tried his best to please some thing for everyone. Given the choice of Avengers budget, this movie would have been different. But unlike watching a movie like a movie, I think the writer kept bringing all the movies in front and missed enjoying this movie as it is. Because it is made in India. It has its own essence.